Collision and electrocution by powerlines are considered to be a major cause of death for some bird species. Results of a recent study show that this is the case in Saudi Arabia, and that powerlines are therefore an important conservation concern. 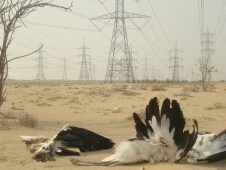 Between 2008 and 2011, a powerline located 100 km south of Jeddah in Saudi Arabia was monitored for bird fatalities (Shobrak 2012). The area surveyed was selected after a local group, Maksat, reported 150 carcasses of White Stork Ciconia ciconia in August 2008. The subsequent study took place over three sites and utilised two differing survey techniques—semi-systematic and general surveys. Twenty identified species and two unidentified warblers where found to be affected by the powerlines during the four year study period, with 532 individual carcasses retrieved. The majority of species found were migratory, with only two resident species—Namaqua Dove Oena capensis and Brown-necked Raven Corvus ruficollit. The most affected species in the study area where White Stork, Common Quail Coturnix coturnix, Willow Warbler Phylloscopus trochilus and the Near Threatened Corncrake Crex crex. Common Quail seems to be especially susceptible and was found in high numbers. The concentration of bird carcasses along one section, just 2 km in length, suggests that the powerline crossed an important migration route for several species. At the moment, the death rate from powerlines is probably low at the population level for most species; however, powerline mortality is likely to be an important concern for rare or declining species. With increasing energy demands within Saudi Arabia resulting in the construction of more powerlines, there is likely to be an increase in bird deaths unless appropriate mitigation measures are put in place. Particular attention should be paid to areas with high concentrations of migratory birds. Shobrak, M. (2012) Electrocution and collision of birds with power lines in Saudi Arabia. Zool. Middle East 57: 45–52.